We teach classical Isshunryu Karate in a friendly non-threatening environment. in Whitehouse Station New Jersey. Everyone, regardless of rank, is treated with respect. Each student starts at the beginning and progresses at his/her own pace. Along the way, one naturally develops strength, endurance, agility, coordination, self confidence, and a healthy respect for violence. It is hoped that with this knowledge and self- confidence, violence can be avoided or at least limited or contained. We believe that each person has the right to defend himself, but no one has the right to use excessive force. And no one truly wins a real fight. Promotions are based on 4 elements: attitude/character, terminology/history, the performance of kata, and kumite/sparring. During the first 4-6 weeks, students learn basic hand and foot techniques which, if practiced diligently, constitute a system of self defense. Students do not spar until the rank of orange belt (about 6 months), and weapons are not taught until 2nd degree brown belt (minimum 3 years). This dojo has been in operation for almost 20 years. 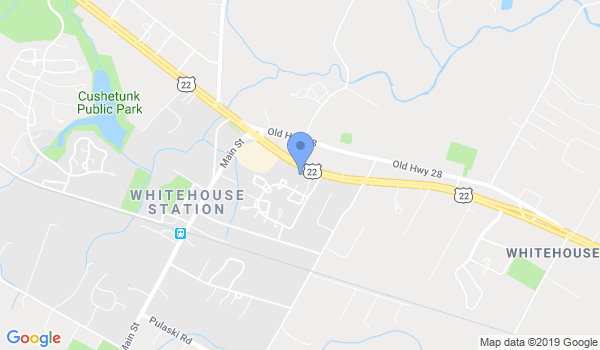 We are conveniently located to teach interested students of karate in central New Jersey near Somerville, Flemington and Clinton New Jersey in Hunterdon County and Somerset County. Class are held Monday Evenings from 7-9 PM. Would you like more information on hours, classes and programs available at Karate of Hunterdon? Please contact the school with your questions. Update the details, Write a Review or Report Error of Karate of Hunterdon. View all Dojo in Whitehouse Station or in Zip code 08889. This Chart shows the Martial Arts Styles offered most in Whitehouse Station, New Jersey area. View a list of Dojo in Whitehouse Station, or enter your address below to find schools closest to you.